Golf in the Charleston area can pretty much be divided into north and south, centring around our two island destinations, Wild Dunes and Kiawah. 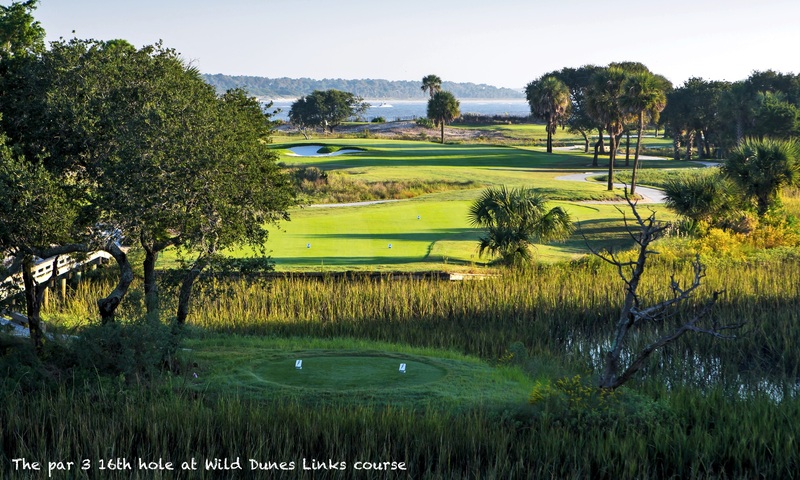 There are two 18 hole championship courses on Wild Dunes Resort and FIVE on Kiawah Island Resort. In both cases it is cheaper to play the courses if you stay at the resort so when considering whether to stay in Downtown Charleston or staying on either of these top class resorts you should take this into account. Wild Dunes Links course is the more highly acclaimed of the two on-site courses with the finishing stretch right along the oceans shore. However, the Harbor Course with many holes benefitting from views of the wetlands is perhaps the more picturesque. Both courses will test your game with plenty of danger on most holes and some of the smallest greens you will ever see. Wild Dunes Links also has the distinction of being the first solo course design by renowned designer Tom Fazio. In recent years they lost the par 5 18th hole to the sea, so Fazio came in for a redesign and created a brand new par 3 18th hole in it’s place with the ocean as a backdrop. In the area just north of Charleston, inland from Isle of Palms, there are some excellent courses which offer fantastic views and great golfing variety. Dunes West is a parkland style layout with generous fairways but challenging green complexes and finishing hole that borders the Wando river. We love the clubhouse situation and you are assured of a warm welcome. Excellent place for lunch after your morning round. Patriot’s Point boasts spectacular views of Charleston harbour so if your golf is a little off, just enjoy the views! Charleston National and Rivertowne Country Club, which hosted Annika’s tournament on the LPGA Tour for a couple of years, both feature wetlands on numerous holes so there are plenty of challenges to go with the picturesque settings. South of Charleston is the Links at Stono Ferry, site of a revolutionary battle in 1779. Today the battle is with the golf course with plenty of challenges to deal with and spectacular views as the second nine winds its way along the shore of the Intracoastal Waterway. A little further south are the barrier islands of Kiawah and Seabrook. There are four courses on Kiawah Island itself including the world famous Ocean Course plus. The others are Turtle Point, Osprey Point and Cougar Point. Oak Point, situated just off the island, makes up the five resort courses. Nearby Seabrook Island also has two outstanding championship courses, Crooked Oak and Ocean Winds. The Kiawah courses are a lot cheaper if you stay on the resort so consider checking out our Kiawah Island Resort pages for more information. To help plan your trip please take a look at our Charleston intro and Charleston accommodation pages to help build your perfect trip.